Rohani European beech trees line the Ohio Chapter International Society of Arboriculture Allée, a walkway beginning at the southern entrance to the Lane Avenue Gardens at the eastern end of the Agriculture Administration Building parking lot. In 1994, Chadwick Arboretum celebrated Arbor Day with the dedication of an allée of Carpinus betulus 'Fastigiata', upright European hornbeam trees donated by the Ohio Chapter ISA. The ceremony also included a dedication of a memorial plaque that was was donated by the Columbus Landscape Association, the Northern Columbus Kiwanis Club, and the Ohio Chapter ISA in memory of Dr. Lewis C. Chadwick, the founder of the International Society of Arboriculture (ISA). The hornbeams were removed due to borer damage and replaced with Fagus sylvatica 'Rohanii' – Rohani European beech. To learn more about the International Society of Arboriculture, click Ohio Chapter International Society of Arboriculture. A significant collection of native witchhazel is located just south of the Rohani European Beech Allée. 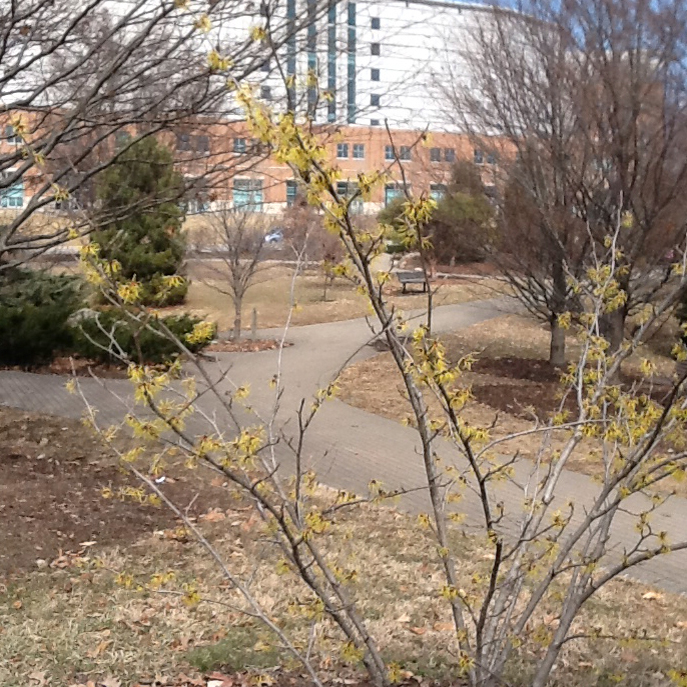 These witchhazel begin blooming in October and November and continue blooming throughout the winter. Winter color and fragrance are just a couple of this shrub’s many attributes. Horticulture alumna, Melissa White, owner of Begonia Park and Company, is responsible for the research, selection, installation, and maintenance of the Chadwick Arboretum Witchhazel Collection. Melissa regularly consults with renowned Hamamelis breeder, plantsman, and OSU alumnus Tim Brotzman of Brotzman's Nursery. For additional information about our witchhazel collection among others, see the November 2012 Issue of Ohio Magazine "Bewitching Blooms" article by Jill Sell. The Quasimodo witchhazel is covered with burnt orange, spidery, fragrant flowers in late winter/early spring. The medium to bright green leaves turn golden-yellow in fall. Click on Hamamelis or Fagus sylvatica 'Rohanii' (Rohani European Beech) for a photograph and one or more links to information about these trees from The Ohio State University Plant Facts, Wikipedia, and/or USDA Plants Database. Or click Plant Search Database and simply enter the botanical name (genus only will work) of any tree on The Ohio State University Columbus campus. If you do not know a tree's botanical name, you can find it by searching the web using the tree's common name. We are in the process of adding QR codes to our plant labels throughout the arboretum. If you are walking in the gardens and see a plant label with a QR code, use your smart phone or tablet QR reader app to access a photograph and description or link to additional information about the tree. If you don't have a QR reader app, you can download one for free from your app store.